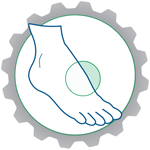 We see a wide range of presenting foot and ankle conditions at our Norwich clinic. Whatever your problem, we have the skilled medical expertise to unravel the cause and offer solutions. Many of our patients have foot and ankle pain caused by sports injuries, especially athletes involved in high impact sports. Other patients have foot and ankle complications such as flat feet, bunions and toe deformities that are indicative of poor biomechanics, this can distort normal joint function and cause pain and the resulting complaint. This page provides a comprehensive list of the many concerns our patients come to see us about. The page is in alphabetical order and by scrolling through and clicking on the condition, you can read the characteristics of that particular problem. The most common ailments have more detailed descriptions. A common ankle injury that usually involves over-stretching and damage to one or more of the ligaments on the outside of your ankle. An injury to the ankle muscle or tendon that leads to muscle strain or tearing. Normal pronation involves the rolling inward of your ankle and rolling outwards of your heel, allowing you to absorb shock and adapt to the ground you walk on. Problems occur when pronation is too fast causing stress on the muscles or too late causing your arch to collapse. Supination is the opposite to pronation, it allows you to stabilise your foot and have a solid platform to spring off. High arches occur when your foot is unable to pronate enough to lower your arch that reduces shock absorption and gives you a stiff foot. Damage to the posterior tibial muscle will cause pain to the inside of your ankle or calf. If the muscle is injured your arch will start to lower and your foot become wider. Chronic ankle instability or poor biomechanics cause the small tunnel between the two bones underneath the ankle to become too mobile, damaging soft tissue structures. If the tunnel that the Tibial nerve runs through is ‘closed off’ (e.g. flat feet), vague or shooting pain in or under the heel will occur. When the joints in your foot do not work in unison or if they are placed under excessive stress, it can lead to inflammation of the joints (arthritis). The protective fat pad under your heel can thin with certain conditions and age, which leaves the underlying structure damaged and the pad inflamed. A bony protrusion from your heel caused by repeated overloading of the plantar fascia, leading to a prolonged cycle of damage and repair. Several muscles run under your arch and attach to your heel. Inflammation to one or more of these muscles will cause heel pain. True plantar fasciitis is caused by damage and stress to the thick tissue called fascia running under your foot. Heel pain syndrome is an umbrella term for pain when rising, which then passes, only to return later in the day. The bones of the ankle stop moving freely over or against each other, restricting one or more of the movements of your ankle. The tendon that attaches the calf muscle to the heel bone becomes swollen and inflamed. You will experience pain every time you put your foot down with a fractured heel and will need to protect it with a heel support. Irritation and stiffness in the tendon that attaches the calf muscles to the heel bone. A small lump found within the Achilles tendon behind the ankle; this shows poor functioning of the tendon. Unique to growing children, particularly active ones. The pull of the Achilles’ tendon is greater than the strength of its attachment to the heel and pain is felt at the Achilles. 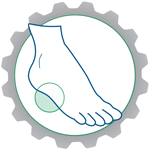 A Callus is your skin’s response to pressure and friction resulting from poor biomechanics. If the stress is not removed, it becomes a painful corn. The result of inappropriate use of the muscles working your toes. Either overloading the joints or muscles being used for the wrong job. When you fracture a toe, it is notoriously difficult to splint. 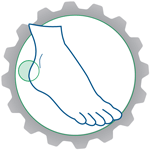 Orthotics can ease the pressure allowing your toe to heal. An umbrella term to describe pain in the front part of your foot. Common metatarsalgia conditions include Morton’s Neuroma/Neuritis; Capsulitis and/or Synovitis. A burning sensation, classically between toes 3 and 4 which is caused by biomechanical irritation leading to inflammation around nerve cells. Hallux rigidus (bony restriction of big toe function) or limitus (soft tissue restrictions) is often misdiagnosed as a bunion because it causes a bony lump to arise from the top of the big toe joint. A bony enlargement on the big toe joint that forms when the bone leading up to your big toe moves way from the others creating an uneven pull between muscles in the foot and big toe. A metabolic disorder causing a build up of salts in your joints, primarily the big toe joint. There are two ‘floating’ bones under the ball of your big toe. These move as your big toe propels you. If they become stuck, they cause pain under the ball of your big toe. When the joints in your foot do not work in unison or if they are placed under excessive stress, it can lead to inflammation of the joints (arthritis) and excessive wear and tear. This occurs when the cuboid bone is out of place, causing pain on the outside of your foot running down to your two outside toes. Normal pronation involves the rolling inward of your ankle and rolling outwards of your heel, allowing you to absorb shock and adapt to the ground you walk on. Problems occur when pronation is too fast causing stress on the muscles, or too late causing your arch to collapse. The name given to a bump on the top of your foot – a collection of nerve tissues/mass of soft tissue. An injury to the foot muscle or tendon that leads to strain or tearing. Several nerves run around or under your ankle, if the nerves are damaged, it can cause shooting or burning pain in your ankles and feet. 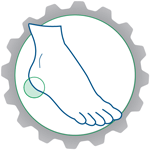 Solve your problem with the right foot and ankle treatments. Symptoms of over-stretching or damage to the ligaments will include immediate pain and swelling. An ankle sprain is a common ankle injury that usually involves over-stretching and damage to one or more of the ligaments on the outside of your ankle. The ankle is a complex joint held together by a system of ligaments essential for transmitting movement and weight between your foot and the rest of your body. Ankle sprains happen if the ligaments around the ankle joint are damaged. Ligament damage is often graded as mild when a ligament is stretched; moderate when there is a partial tear and severe when a ligament is severed. Symptoms of over-stretching or damage to the ligaments will include immediate pain and swelling. For more severe sprains, weight bearing may be difficult for a while and you may experience knee pain caused by the ankle sprain. Nerve damage after a severe sprain may occur if long-term swelling compresses the nerves around the ankle. We will carefully assess your condition and will prescribe a suitable range of measures to aid your recovery, which may include one or a combination of stretches and exercises, Foot Manipulation Therapy and orthotics. When the joints in your foot do not work in unison or if they are placed under excessive stress, it may lead to inflammation, pain and swelling of the joints (arthritis). When the joints in your foot do not work in unison or if they are placed under excessive stress, it may lead to inflammation, pain and swelling of the joints (arthritis). During normal daily activity your ankle does a tremendous amount of work. It is the key joint allowing you to pivot over your foot. Misaligned joint function or excessive stress from flat feet, high arches or even knee or hip problems can cause the ankle to ‘wear out’ and become arthritic. If your ankle is not working properly you will have to get the ‘pivot’ from somewhere else, making your foot, knees, hips or back work harder. Pain and stiffness in the joint is a common symptom of an arthritic ankle which can make walking and activities difficult. Stretches and exercises, acupuncture, Foot Manipulation Therapy and orthotics can all bring relief to an arthritic ankle. At Norfolk’s BxClinic we will discuss the best therapies for you and offer support and advice to help you manage your pain and help you continue your daily activities. A bony enlargement on the big toe joint that forms when the bone leading up to your big toe moves away from the others creating an uneven pull between muscles in the foot and big toe. A bony enlargement on the big toe joint that forms when the bone leading up to your big toe moves away from the others creating an uneven pull between muscles in the foot and big toe. Over time, this action causes your big toe to pull towards your other toes eventually causing wear and tear to the joints, pain and arthritis. Poor lower body biomechanics will cause bunions to form, but those who run a lot or wear ill-fitting shoes are also at risk. Arthritis/Bunion – Hallux rigidus (bony restriction of the big toe functions) or limitus (soft tissue restriction) is often misdiagnosed as a bunion because it causes a bony enlargement on the top of your big toe joint. It’s extremely painful in the foot and even into your shin as your body tries to make up for the missing big toe joint function. Surgery for removal of a bunion is often only undertaken in the most severe cases; it cannot guarantee you will be pain-free with a perfectly aligned foot and it can permanently reduce the flexibility of the foot. At Norfolk’s BxClinic, we will discuss with you some options that can greatly reduce your pain and discomfort without the need for surgery. Our client-specific stretches and exercises, Foot Manipulation Therapy and orthotics have repeatedly shown to provide great pain relief from painful bunions. Your skin’s response to pressure and friction, resulting from poor biomechanics. The formation of a callus on the bottom of your foot is your skin’s response to pressure and friction, resulting from poor biomechanics. If the stress is not removed, it becomes a painful corn. Removing the callus and corn can provide a temporary remedy and reduce the pain. However, without permanently removing the cause of the pressure or friction the pain will come back every time, often very quickly. Foot Manipulation Therapy and orthotics can adjust the imbalance in your lower body biomechanics and bring long lasting pain relief. When the cuboid bone, a square-shaped bone just in front of the heel bone, is out of place. Cuboid problems occur when the cuboid bone (a square-shaped bone just in front of the heel bone) is out of place. A vague pain on the outside of your foot running down to your two outside toes is a classic symptom of a problem with the cuboid bone. A displace cuboid bone is sometimes found to be the cause of lingering pain after an ankle sprain. Foot Manipulation Therapy and precision made orthotics can alleviate the problem. People with flat feet pronate too much which can cause symptoms of heel pain, back pain and knee pain. A true flat foot is when the bones of your arch touch the ground when walking and standing, normally as a result of over-pronation. Pronation is a normal movement occurring around your ankle characterised by the rolling inwards of your ankle and the rolling outwards of your heel bone and is your body’s natural shock absorption. People with flat feet simply pronate too much which can cause symptoms of heel pain, back pain and knee pain. Flat feet can affect both adults and children and in both cases our precision made orthotics (inserts custom made to fit perfectly and comfortably into your shoes) will correct your flat foot and support the way you walk, reducing your discomfort. If you enjoy running we can make bespoke running orthotics. We can also prescribe stretches and exercises and Foot Manipulation Therapy, which are extremely beneficial. When you cannot lower your arch enough, which gives you ‘high arches’ and leaves you with less shock absorption, which adds stress to the heel and ball of the foot. High Arches occur when you are unable to ‘pronate’ enough (the rolling inwards of your ankle and outwards of your heel bone). Supination is a normal movement occurring around the ankle joint, it is essentially the opposite of pronation and allows you to stabilise your foot and have a solid platform to spring off. Problems arise when you cannot lower your arch enough, which gives you ‘high arches’ and leaves you with less shock absorption, which adds stress to the heel and ball of the foot. With high arches the shock of the heel striking the floor in the normal walking cycle causes foot pain and transfers pain into the hips, ankles, knees and lower back. 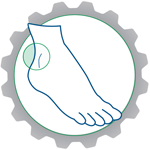 Our precision made orthotics (shoe insoles) will correct your symptoms and give your high arched feet support, reducing the shock impact and taking away your discomfort. If you find running difficult because of your high arches we can design precision orthotics (inserts) for you that will greatly increase your comfort when you run. Foot Manipulation Therapy and stretches and exercises are also very effective in helping the symptoms of high arches. Ill-fitting shoes are often a primary cause of compressing the nerve along with foot deformities and repetitive irritation through sports. Persistent inflammation (neuritis) occurs when the nerves that run between your metatarsals to your toes (the 3rd and 4th toe) are damaged due to excessive compression leading to symptoms of numbness or a burning sensation in the ball of the foot or toes. If the inflammation continues the cells around your nerve that help the nerve signal transmission become enlarged and less effective (Morton’s Neuroma). Ill-fitting shoes are often a primary cause of compressing the nerve along with foot deformities like bunions and flat feet and repetitive irritation through sports such as running and court sports. At BxClinic, we will frequently advise a treatment course that will involve either Foot Manipulation Therapy, orthotics or acupuncture (or a combination) to help your recovery and provide you with pain relief. Caused by damage and stress to the thick band of tissue called fascia that runs under your foot connecting the heel bone to the toes. True plantar fasciitis is caused by damage and stress to the thick band of tissue called fascia that runs under your foot connecting the heel bone to the toes. The fascia also helps to support your arch as you push off the ground and takes multiple times your body weight through your step. Damage and stress to the fascia can cause inflammation and pain in the heel or bottom of the foot when standing or walking. To find out what is causing your plantar fasciitis pain we have to assess what has caused the excessive stress. Common causes can include a sudden increase in intense exercise particularly running, being overweight, constantly being required to stand for long periods, flat feet or high arches, tight Achilles and ill-fitting shoes. Our precision made orthotics often provide the ideal remedy for plantar fasciitis; the custom designed insole will fit into your shoe or boot and provide arch support. We are likely to recommend a combination of stretches and exercises, acupuncture and Foot Manipulation Therapy to help cure your pain and bring long-term relief to sore feet and heels. Plantar Fasciitis is also a common ‘umbrella’ term used to describe heel pain in general. Classic symptoms of ‘heel pain syndrome’ include pain in the heel when rising which then passes, only to return again later in the day. Intense ‘pin-point’ pain under the ball of your big toe. There are two ‘floating’ bones under the ball of your big toe. These bones move as your big toe propels you off the ground. If they become stuck or crushed, they cause intense ‘pin-point’ pain under the ball of your big toe. At Norfolk’s BxClinic will we carry out a detailed analysis of your foot which will show us if the bones are getting stuck or getting crushed. Once we have established this, we will get them moving for you if they are stuck or we will give them the freedom to move if they are getting crushed. We achieve this through effective use of Foot Manipulation Therapy, acupuncture and bespoke orthotics (individually created shoe insoles). These therapies should leave you pain-free without needing to undertake MRI scans or consider surgery. Condition unique to growing children, particularly active ones. Sever’s Disease syndrome is a condition unique to growing children, particularly active ones. As a child grows, the heel bone is one of the first to reach full adult size. When the tendons, muscles and ligaments don’t grow as fast as the heel bone, they are stretched too tight causing the child to feel pain at the Achilles. Children who are involved in sports that involve a lot of running and jumping like football, gymnastics, dancing and basketball often experience Sever’s Disease. Acupuncture, bespoke orthotics (custom-made shoe inserts), stretches and exercises and Foot Manipulation Therapy are all extremely effective in bringing relief and cure from Sever’s Disease and following assessment Norfolk’s BxClinic will prescribe one of a combination of these to help your child. If your foot is unstable or your muscles weak, the function of your toes will be impaired and over time become fixed and possibly arthritic. If your foot is unstable or your muscles weak, the function of your toes will be impaired and over time become fixed and possibly arthritic. The muscles that control your toes are divided into those that originate in the calf and the lower leg and those that originate in the foot. Lesser toe deformities such as claw toes and hammertoes are commonly caused by these muscles being used in the wrong way. 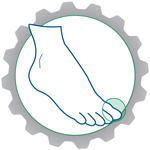 If your foot, ankle or general gait biomechanics are not working properly, the controlling toe muscles that originate in your lower leg can be recruited to help which pulls the toes out of position. The earlier this can be identified and treated the better, left untreated the toe joints become fixed which can be painful and harder to treat. Toe deformation also makes it very difficult to find shoes that fit and are comfortable. At Norfolk’s BxClinic, we will assess the cause of your toe deformity and recommend a combination of Foot Manipulation Therapy, stretches and exercises, orthotics and acupuncture, all of which offer excellent pain management. 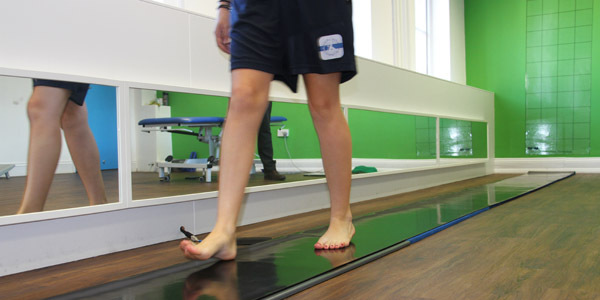 At BxClinic, our clinicians specialise in detailed gait analysis using sophisticated technology. This pinpoints the underlying causes of your pain and we can then recommend one (or a combination) of therapies.